Ah, the first dive. Nostalgia. An experience that you carry for an entire lifetime, full of beauty, and bliss; an experience that words can’t-do justice. You can hardly sleep the night before. The ride out becomes a journey as you hype yourself up for the experience. However, the adrenaline of the experience can create tunnel vision, and the bigger picture goes out the window. Not thinking about the minute details can cause unnecessary stress on your first dive so here are Five Tips that will help you get the most out of your first time! Your group will be a mixed batch of novices and experts. You may be able to pick differences based on the faces on the boat ride: Who has a smile, whose legs are shaking, who’s talking about tall tales of their adventures in sunken ships, but the differential will be when fins hit the water. Don’t get caught up in following those who are pushing the pace. If you want to check your equipment before jumping in; do it. If you don’t want to dive as deep as others; don’t. If you don’t feel comfortable going into a cave; stay out. Know your comfort zone and stick to it. And, if you feel like adventuring more than usual, make sure you follow our second point. This will be your rock on your first dive. 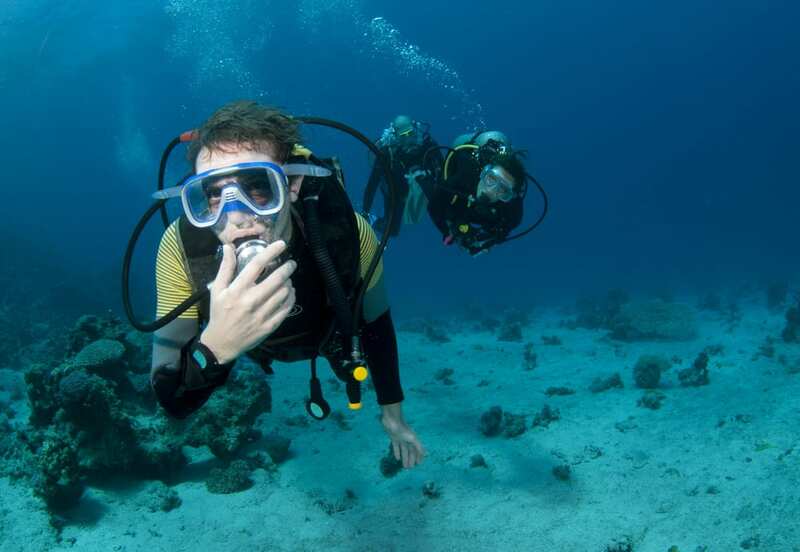 Learn how to communicate with both your partner and dive instructor. Go over hand signals beforehand to make sure you’re confident with them. Once you’re confident make sure you use them underwater and keep a tab on both your instructor and partner. Better yet, when you feel you have the hang of things keep an eye on your partner’s air supply for them. Having a solid form of communication between the two of you can create a dive that allows both of you to have more confidence and reduces anxiety. Trust us; we get it. That fish is unbelievable, the coral is unlike anything you’ve seen before, and that shark – wow – you never knew how beautiful these supposed monsters would be. But, when you pick your head back up, you have lost touch with your surroundings and have a mini heart attack before relocating the group. Save yourself the anxiety and take a moment to check in with your surroundings. Remind yourself to check your air, locate your buddy, and keep an eye on the group. This also helps protect the environment. Not paying attention to a fin kick could damage a reef or hit a buddy within reach. Remember when you were in class as a kid and had a question you were begging to know but didn’t ask because the fear of being “dumb.” Then, remember when someone would ask that same question, and a wave of relief would wash over you because they had the courage? In scuba diving, it’s the same thing. Your question is on everyone’s mind, and they will be beyond grateful with you asking. So please, for the sake of the rest of us, ask that question. A first dive will be the most beautiful experience you’ve partaken. The ocean is incredible, reefs are immaculate, and you’ll never realize how beautiful marine life could be. However, there is a great deal going on. You have your oxygen to check, you have to be aware of currents, and you have to keep an eye on the group at all times. On top of all that, you have to navigate efficiently. So, before bringing the camera, be confident in your ability to multitask all these first-time obstacles. The last thing we want, is you to have an additional crutch to hurt your experience rather than enhance it.